The basic properties of exponents and logarithms and the fact that the exponential function and the logarithmic function are inverses lead to many interesting problems. For all real numbers x, and all positive real numbers b and N, logb N = x is equivalent to bx = N. If the base is the number e, ln, the natural logarithm, is used instead of loge. By convention, the base is 10 if no base is indicated. logbN is only defined for positive N.
This is equal to xn–1 · x2n · x4–2n = xn–1 + 2n + 4–2n = xn+3. In order to combine exponents using the properties above, the base of each factor must be the same. 3. If log 23 = z, what does log 2300 equal? Note: Examples 3 and 4 can be easily evaluated with a calculator. 4. If ln 2 = x and ln 3 = y, find the value of ln 18 in terms of x and y. 5. Solve for x: log b(x + 5) = logb x + logb 5. Therefore, 3x = 1 and x = . You could also use the change-of-base formula and your calculator. The graphs of all exponential functions y = bx have roughly the same shape and pass through point (0,1). 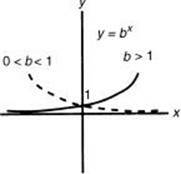 If b > 1, the graph increases as x increases and approaches the x-axis as an asymptote as x decreases. The amount of curvature becomes greater as the value of b is made greater. If 0 < b< 1, the graph increases as x decreases and approaches the x-axis as an asymptote as x increases. The amount of curvature becomes greater as the value of b is made closer to zero. 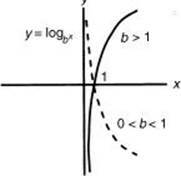 The graphs of all logarithmic functions y = logb x have roughly the same shape and pass through point (1,0). If b > 1, the graph increases as x increases and approaches the y-axis as an asymptote as x approaches zero. The amount of curvature becomes greater as the value of b is made greater. If 0 < b < 1, the graph decreases as x increases and approaches the y-axis as an asymptote as x approaches zero. The amount of curvature becomes greater as the value of b is made closer to zero. (E) The value of x cannot be determined from the information given. 6. If ln (xy) < 0, which of the following must be true? 3. (A) log(10m2) = log 10 + 2 log m = 1 + 2 · = 2. 4. (B) ba = 5, bc = 2.5 = 5x , using the relationships between logs and exponents: (ba )x = bax = 5x = bc . Therefore, ax = c and . 6. (B) Since ln stands for loge, and e > 1, xy < 1. * 7. (D) Converting the log expressions to exponential expressions gives and . Therefore, mn = . * 10. (D) Substitute in A = Pe0.03t to get 600 = 300e0.03t. Simplify to get 2 = e0.03t . Then take ln of both sides to get ln 2 = 0.03t and t = . Use your calculator to find that t is approximately 23.